Following steps for writing a sample java program to connect to the database and get the result. JDBC API is provided by sun framework which contains different interfaces and classes to connect to databases. 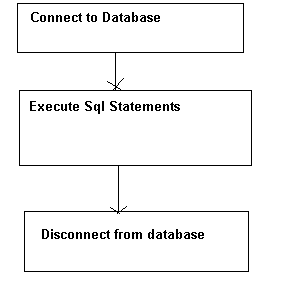 The below diagram depicts the steps to connect to any database. Class.forName("sun.jdbc.odbc.JdbcOdbcDriver");:- loads the JdbcOdbcDriver class into the jvm and avialble to ready to use. DriverManager.getConnection("jdbc:odbc:orc","scott","tiger"); :-connection string has to be provided, which contains username,password,database name of oracle. con.createStatement(); :- return the statement object which is used to get the result set using executeQuery method. ResultSet object holds all the rows of a table which are in the order by the result of the query.we have to traverse the result set and fetch each column value. This topic has been a very basic start to explore on JDBC example. Hopefully, you have enough information to get started.